If you have been following my blog for a while you will have noticed my periodic sharing of articles that I write for the SC Johnson Greener Choices blog. I was asked to be on their blogger panel a couple of years ago and when I started researching SC Johnson’s commitment to the environment I was really quite impressed. They are making incredible strides to reduce their environmental footprint and should be a model for other mainstream companies to follow. What sort of steps has SC Johnson taken over the past few years to become more green? Keep reading to learn a little bit more about their environmental commitment. In December of 2012, SC Johnson has powered up two state-of-the-art 415-foot wind turbines at its largest global manufacturing facility. These two wind turbines can generate 8,000,000 kWh of electricity annually which will eliminate 6,000 metric tons of carbon emissions every year. That is enough electricity to power 700 homes for a year. They now have the largest onsite company-owned wind turbine manufacturing project in the Midwest. The turbines, combined with other clean energy systems already in place, will generate an average of 100% of the electrical energy needed to operate the facility onsite. That means that products like Scrubbing Bubbles®, Glade® and Windex® will now be made using clean energy. This is not the first step that SC Johnson has taken over the past few years to reduce their carbon footprint. In the mid-2000s, two systems were put in place that use waste methane gas from a nearby public landfill and clean burning natural gas to generate 85 percent of the facility’s electrical energy. The new wind turbines will provide the remaining 15 percent. The company’s goal is to increase worldwide renewable energy use to 44 percent of total electricity by 2016. At the SC Johnson plant in Medan, Indonesia, waste palm shells are used as a replacement for diesel fuel. It transfers a waste product back into the value chain with minimal impact and has reduced local diesel fuel use by 80 percent. It cut greenhouse gas emissions by more than 15 percent. In May 2012, they launched a new biofuel initiative at their factory in Surabaya, Indonesia using waste husks from rice grains as a fuel source. The energy is then used to heat water in their manufacturing plant. American’s buy 320 million cleaning products in trigger bottles each year. Millions of them end up in landfills! By comparison, concentrated refills use less packaging, decrease shipping impacts and reduce waste. If just 20 percent of those 320 million bottles were refilled rather than discarded, it could save plastic equal to the weight of about 1,170 minivans. The SCJ new concentrates come in small, easy-to-pour bottles made of the same recyclable plastic as a milk jug. Check out the Greener Choices Marketplace to purchase refills and reduce your own carbon footprint! Several solar projects are helping provide hot water heating for the company’s facility in Shanghai. Additionally, SC Johnson is also working towards becoming landfill neutral by 2016. Through operational commitments, the company expects to eliminate or divert more than 480 million pounds of waste from the nation’s landfills. I encourage you to learn more about SC Johnson’s environmental commitment and check out their Greener Choices blog for creative ways to reduce your own carbon footprint! Disclaimer: I am compensated for the articles I write for the SC Johnson Greener Choices blog but all opinions expressed are mine and mine alone. I'm impressed! 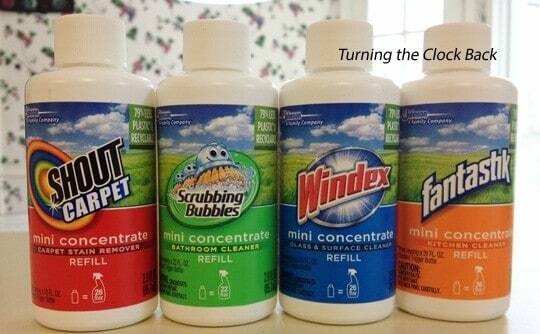 I need to check out the concentrated refills and see if I can find them in my store. I've always been a fan of SC Johnson and all their social responsibility endeavors. I wasn't ware of their commitment to the environment as well; all the more reason to intentionally seek out their brands. I am in the midst of a major cleaning overhaul, when I make my supply run I will be making a point to pick up the refill varieties! A great share! Thank you so much!! Love hearing about SC Johnson's green efforts! I love that they are so eco friendly. I'm going to have to check at Krogers and see if they carry these.